1. When my boyfriend brings over his CSA box, I need not panic. I live in an intentional community and we have a small CSA here. When Vlad occasionally gives me his entire box, I usually take one look and throw my hands in the air (good thing I’m not an ER doctor). I don’t know what to do with all of the kale, Swiss chard and other leafy greens in there, and if I don’t deal with them immediately, they wilt away in the box to a lifeless green mass. But Cheyenne’s post, “Keeping your CSA Goodies Fresh,” on The Spotted Apple has bought me some time. My vanilla, curing. I’ll give some of this away. 2. I can make a lot of stuff myself. Of course, I know this already, but I need regular reinforcement, as with any religion (my daughter Charlotte calls me an “environmental zealot”—religious fervor skips a generation; ask my Catholic mother). I thought vanilla came from a bottle after undergoing a complicated transformation, best left to the experts. Did you know you can “make” vanilla? It’s incredibly easy. I learned about this on the Queen of Happindom’s blog, Happiness in Jars. Check her post out here. I got a bit carried away and started three cups. 3. I can cook in my crock pot with impunity. This week, Louba from Beautiful or Practical wrote a post about her energy audit of her appliances. I had wondered if I really conserved much energy running my slow cooker for eight to ten hours straight. Well, I found out it uses only a trickle of energy. 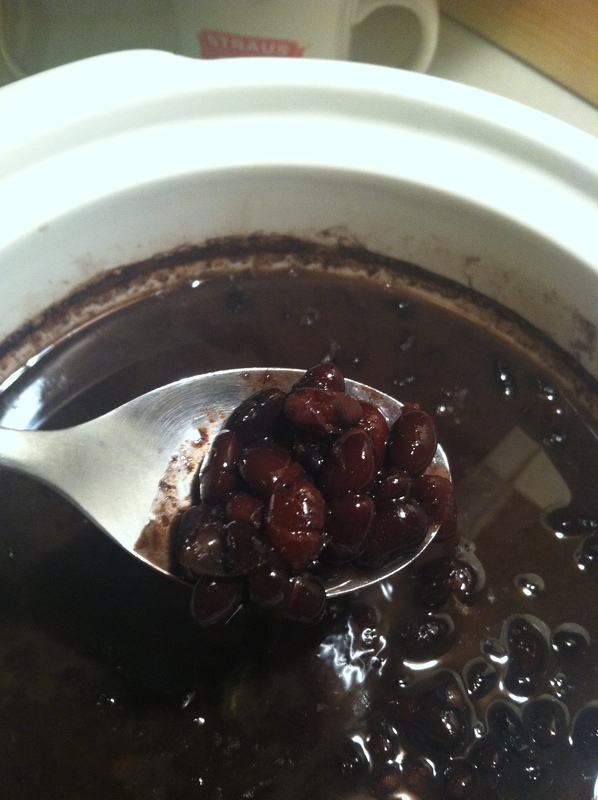 I use mine to cook beans or make bone broth only, but I’ll try using it more often, perhaps for a braise or this Alton Brown recipe for baked beans, which I make regularly. Louba was inspired by Lindsay’s post at Treading My Own Path, in which she discusses just how much energy a typical refrigerator uses—more than the “average citizen in each of six African nations.” You can read that post here. 4. Other bloggers are totally awesome. I recently gave away some homemade cloth produce bags to help reduce plastic consumption. You don’t really need a pattern for these, they practically make themselves, but here is mine. One of the bloggers I sent them to, Christina of Little Sprouts Learning, sent me a shopping bag her daughter had made from an old tank top. 5. Ron Finley is my hero. I know ten minutes to watch a video seems like a long time. But you will not regret spending it viewing Ron Finley’s TED talk. This revolutionary grows food in abandoned lots and parkways in the food desert of South Central LA, where “the drive-thrus are killing more people than the drive-bys.” He says that over 700,000,000 tomato plants could grow in the 26 square miles of abandoned lots in LA! But I don’t want to give away too much. Just watch the video. Then get back to me about starting The Ron Finley Fan Club. How about you? What have you seen lately in social media that inspired you? Oooh, me. I *love* Ron Finley and I will join the fan club with you. Looking forward to reading about to handle the CSA glut–it overwhelmed me last summer and so we didn’t re-up, but maybe this will make me reconsider! As for links, I just found this blog, maybe not new-to-you: http://christinehennessey.blogspot.com/. Gotta love someone who names her chicken Alice Munro. I finally, just now, finished cleaning up today’s farmer’s market haul. (Eating this way is a big commitment.) I think you’ll find the tips on the CSA useful. Thanks for the quote 🙂 Your comments about the CSA box really made me laugh, I had to stop our veg box because it started to feel like I was on a cookery challenge! The husband won’t eat kale unless it is disguised, the best recipe I found was for kale and mushroom lasagna, lots of cream and cheese distracted him! The Ron Finlay talk is really inspiring, I found it a while back and sent it to everyone I knew, we need more of this in the world. Great video by Ron Finley. Thanks for sharing. I thought of doing the same thing in our area (not as big as LA) but met so much resistance. Maybe I should be like Ron and fight a little harder. You’re welcome. Isn’t he wonderful? People have started doing this in San Francisco, but I’m not sure to what extent. I know of at least one garden in an abandoned lot. Eventually people will just get it and stop resisting. Good luck! Thanks for the linkage! I’ve found many a green spoiling away in my fridge, this is the only way I can keep on top of them. Also, homemade vanilla is SO much better than store bought. Save the beans when you are done and throw them in some sugar, wait a month or two, and you’ve got a second offering; Vanilla Sugar. I didn’t believe that social media would work for me but have come to really embrace the WordPress world–a great community of open-minded souls, witty, erudite & super-talented. PS, I started a small jar of vanilla a couple of months back (got the starter kit from Chinaberry catalog, I believe). More from the chapter “great minds think alike”! PPS, know about Finley’s work, too, cuz I’ve got so many old friends from L.A. where he has many fans in the food justice world. Thx for getting these messages out!!! The starter kit called it “everlasting vanilla” and I believe they recommended at least 4 weeks–mine has been steeping for way more than that! It’s a very small jar. More like the kind you buy at the store so easy to squirrel away in the pantry. Since I don’t bake (or make ice cream) enough, I haven’t used it yet. Will have to get on that!!! 😉 Good luck with yours!! !